With the divorce rate in the United States hovering around 50%, combined with an economic recession that has affected all demographics, it should come as no surprise that more couples are turning to social workers for financial therapy. While financial difficulties may not be the root of all relationship strife or marital demise, they certainly play an important role—one that therapists are addressing. In today’s economy, almost everyone is being forced to make financial choices as the cost of gas, food, and clothing surge and incomes remain flat and unemployment high. This has highlighted the need for financial therapy, as many couples are having to reorganize around their finances and, as a result, are experiencing stress in their relationships. As a licensed psychotherapist and author of Worried Sick: Break Free From Chronic Worry to Achieve Mental & Physical Health, Karol Ward, LCSW, agrees that the hottest issues surrounding couples financial therapy have been triggered by the current state of the economy. The recession aside, Wolfsohn points out that many couples also lack healthy personal and financial boundaries or strong communication skills, so money conversations inevitably escalate into ongoing arguments that spill into every area of their lives. The majority of couples Linda Stiles, LSCSW, LCSW, CFSW, works with cite disagreements and stress related to financial issues as a significant problem, sometimes as the primary issue. According to Stiles, a common scenario surrounding couples financial therapy is exemplified by Mary and Bob (names and identifying info changed to protect confidentiality). Bob overspends, resulting in mounting credit card debt. Feeling guilty and afraid of Mary’s reaction, he attempts to hide his transactions. His overspending behavior is tied to stress and other difficult emotions, including feeling powerless in some area(s) of his life. When Mary finds out about the spending/debt, she feels powerless to control her own financial stability due to the shared financial responsibility, the impact on funds for regular bills and other important needs, the impact on their credit scores, etc. She also feels angry and fearful about what may happen to them. Mary also makes negative comments about Bob, undermining his already shaky self-esteem, and he feels less safe in the relationship and less willing to be open and honest with Mary. In these situations, anger and resentment build up, leading to conflict and power struggles. The ripple effect in the relationship can go on and on, perpetuating the negative cycles and leading to additional problems. While disclosing financial stressors is paramount in couple’s financial therapy, a term being bandied about these days is “financial infidelity.” As Bill Frederick, LCSW, PC, of Solution Therapy Center in Muncie, IN, explains, many couples often employ the “this is my money and that is your money” approach—with the implicit understanding of who buys the groceries, who pays for the truck, who covers the electric bill, and so on. For many couples, the deceit and secretiveness of financial infidelity can be as powerful as an extramarital affair. To meet the increasing need for couples’ financial therapy, Wolfsohn has created the Financial Social Work specialty, which has evolved into a two-pronged approach. “Clients use their session time to discuss the issues which are most pressing; these may or may not be specifically about money but are almost always an outgrowth of financial problems or issues,” Wolfsohn says. Additionally, Wolfsohn provides her clients with specific original psychosocial readings and activities they can study and work on between sessions to improve their relationship with their money and to learn more about their financial behavior, which Wolfsohn says are two of the most important components for creating sustainable, long-term financial behavioral change. In her practice, Stiles takes a multifaceted approach when working with couples on financial issues. Depending on the nature of the issues and the seriousness of the financial situation, Stiles utilizes a combination of interventions addressing emotional and relational issues as well as financial management and behaviors. Ultimately, the way a couple communicates and handles conflict about finances and these related issues are the underpinnings of the problem and, in most cases, the couples’ ability to resolve conflict is a key factor in the relationship’s success. Ward uses some aspects of family systems concepts when she works with couples. “The exploration of how their families of origin discussed, handled, and managed finances is very important. Core beliefs about money and where those beliefs originated help the couple understand whether those beliefs are hindering them now,” she says. Ward also has couples create genograms that focus on the financial life of their families of origin. They look at the history of who worked and who didn’t and whether there were gambling, bankruptcy, or entitlements issues. “I have found this can help the couple discover the roots of any long-held family wounds around finances,” she says. Julie Hanks, MSW, LCSW, BCD, owner and director of Wasatch Family Therapy in Salt Lake City, approaches couples’ money struggles from an attachment perspective, first framing the power struggle as part of a larger relational cycle they’re stuck in where one is the pursuer (critical, blaming) and the other is the withdrawer (avoids, delays talking about money issues). One of the first steps for Gretchen Placzek, MBA, LCSW, MSW, of East Bay Family Wellness in Lafayette, CA, is having her clients fill out a money history questionnaire. One of the biggest issues many clients struggle with is shame because of their inability to handle money. “They are ashamed they don’t make enough. They are ashamed they haven’t paid their taxes or have credit card debt. They are usually so ashamed that they don’t share that information or even their struggle with their partner,” Ward says. Likewise, one of the biggest mistakes social workers make in dealing with couples in financial stress is to only focus on the topic of money. Wolfsohn adds that while clients want change, actively participating in personal change requires commitment, which is often strong initially but can be difficult to sustain over time. Wolfsohn’s work has taught her the importance of social workers recognizing how foundational money problems are to all the other problems facing couples. “In some ways, it is unfortunate that financial therapy is still such a new concept, as there are so many clients that need the help and are unaware that the services are available to them,” says Carin Catalano, MPAcc, MS, LMFTA, of Financial Therapy Services, LLC in Seattle. Catalano recommends that social workers and other therapists collaborate with all the professionals in the couple’s life—financial planners, estate attorneys or planners, etc. “This capitalizes on the synergy and expertise of all the professionals involved who understand the client in multiple contexts,” she says. 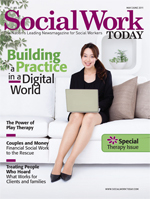 Financial therapy has changed in recent years and is becoming a specialty for many social workers. Certified financial social work programs, such as those at the Center for Financial Social Work in Asheville, NC, provide certification programs that aim to educate social workers on how to help people with financial problems increase their emotional stability by improving their financial circumstances.